A drama about friendship and women's empowerment across the generations, Fried Green Tomatoes has a sprawling story and good performances, but lacks narrative focus. The story is set in Alabama over two timelines. In the present, while on a visit to her husband's aunt at a seniors' care home, middle-aged and frumpy Evelyn (Kathy Bates) bumps into the kindly and elderly Ninny Threadgoode (Jessica Tandy). Evelyn is suffering from neglect in her marriage to Ed (Gailard Sartain), and over the course of several visits is comforted and inspired by Ninny's family history stories. Just after the Great War in the tiny rural community of Whistle Stop, spirited tomboy Imogene "Idgie" Threadgoode lost her loving brother Buddy (Chris O'Donnell) in a train accident. She withdrew further from her family and church, and gravitated towards the edges of the community, enjoying drinking and poker. Her worried mother (Lois Smith) eventually calls upon Ruth Jamison (Mary-Louise Parker), Buddy's former love, to try and cajole the growing Idgie (Mary Stuart Masterson) out of her shell. After a rough start, Idgie and Ruth become best friends. But eventually Ruth gets married to the oily Frank Bennett (Nick Searcy) and moves to Georgia. Idgie later has to rescue the pregnant Ruth from an abusive marriage, and the two women open and operate the Whistle Stop Café. But with the Ku Klux Klan growing in influence and Frank determined to reclaim his child, trouble lies ahead. Back in the present, Evelyn is empowered by the stories of the resolute and tenacious Idgie and Ruth, and starts to make changes in her life to seek he own happiness. 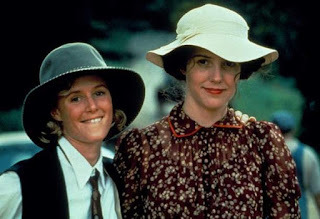 An adaptation of the novel by Fannie Flagg (who co-wrote the script) directed by Jon Avnet, Fried Green Tomatoes aims for a wistful story of women inspiring each other across generations, but is only partially successful. The episodic structure of Idgie's story, which may work well on the written page, translates into choppy cinematic presentation, lacking a cohesive arc. The jumping back and forth between the post-war depression era and the much less interesting modern-day story featuring Evelyn and her husband Ed does not help. What carries the film over its rough patches is a strong theme of friendship between Idgie and Ruth. In the book this is an unambiguous romance, but in search of a broader vanilla audience the film unfortunately reduces the relationship to coy hints of love. Fried Green Tomatoes could have carried a memorable edge, instead it settles for bland instead of brave. Nevertheless, the soulful connection between the resourceful Idgie and the more circumspect Ruth radiates plenty of warmth at the heart of the film. Other social themes pop up as expected in the nostalgic look back at simpler but still dangerous times. Racism, loss, abuse, and fiery religious sermons intermingle with plenty of family support and a sense of small community where everyone knows everyone and they all depend on each other to varying degrees. The performances are uniformly good from the cast of mostly women, with Jessica Tandy and Mary Stuart Masterson notable standouts. Tandy finds the glint in the eye of an old woman with stories to tell, and is the only good thing in the modern-day episodes. Masterson is the rebel woman with a cause, pushing her tiny community towards the future by her sheer force of personality. The final act of the film veers towards a half-baked investigation of a missing-person mystery introduced in the opening scene, and finally a mini courtroom drama complete with a surprise witness and spiritual payback of sorts. While the secret hidden within the lake near Whistle Stop keeps the fires burning, the further the film moves away from the core bond forged between Idgie and Ruth, the weaker it gets. Like all side dishes, Fried Green Tomatoes taste better when surrounded by the genuine glow of family and friends.